There are two main cutting styles for moissanite, brilliant and crushed ice. A brilliant cut stone will reflect the most amount of light and therefore, sparkle the most. Light goes into the crown of the stone, reflects a couple times (off the pavillion facets), and comes back out through the crown. This is the most efficient way for light to travel, and it results in lots of light return, while displaying well-defined pavillion facets. When you look down at a brilliant oval moissanite, you see all the splinters radiating out from the center of the stone (see picture below). 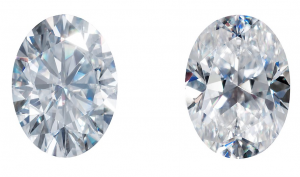 Unlike round stones, ovals have a long side and a short side. The pavillion facets all converge to one point on the bottom of the stone so that the facets going horizontally across the stone are shorter than the facets going vertically along the stone. Because of this, the shorter facets form a smaller angle at the bottom, while the longer facets form a larger angle. In essence, the stone can act like a stone that is cut very deep as well as like a stone that is cut very shallow. You can see from the front view that the small angle on the bottom causes light to leak through the stone. This is exactly why the bowtie effect occurs. The black bowtie seen when looking through the top of the stone are the steepest facets of the pavillion. The longer facets running the length of the stone do a better job at reflecting light back up through the crown of the stone. However, if the stone is too long or too shallow, light leakage can still occur. When cutting an oval, there is a fine balance between cutting a stone too deep and forming a bowtie, and cutting it too shallow, causing light leakage throughout the rest of the stone. 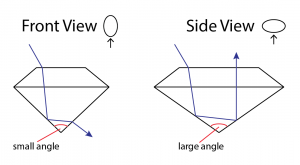 Moissanite has a higher refractive index than diamond, so it’s easier to avoid the bowtie (to read our post on refractive index and dispersion, click here). Moissanite’s high refractive index also makes the brilliant oval reflect light in a similar way to the round brilliant, ie. 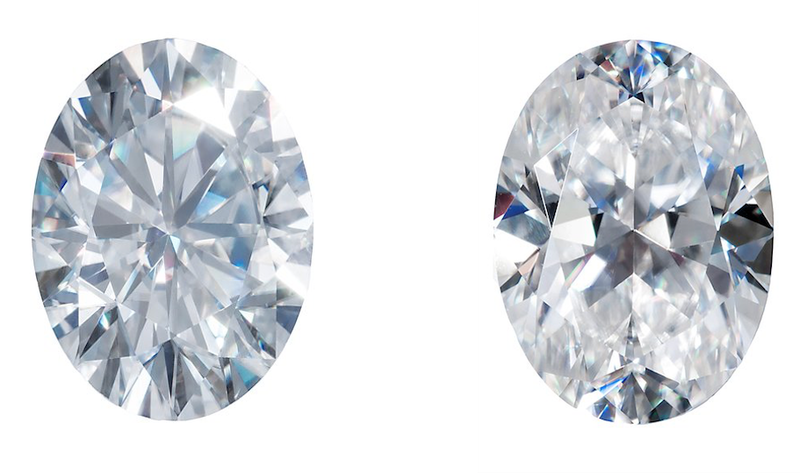 crisp, well-defined facets and plenty of fire and brilliance, whereas an oval diamond tends to have a crushed ice look because the lower refractive index makes the light take a less-than-ideal path as it bounces around more. Consequently, an in-focus pavillion is rarely achieved in oval diamonds, so the crushed-ice look is somewhat standard for an oval diamond. Below shows what happens to light when going through a stone with a higher refractive index (left) vs. a stone with a lower refractive index (right). 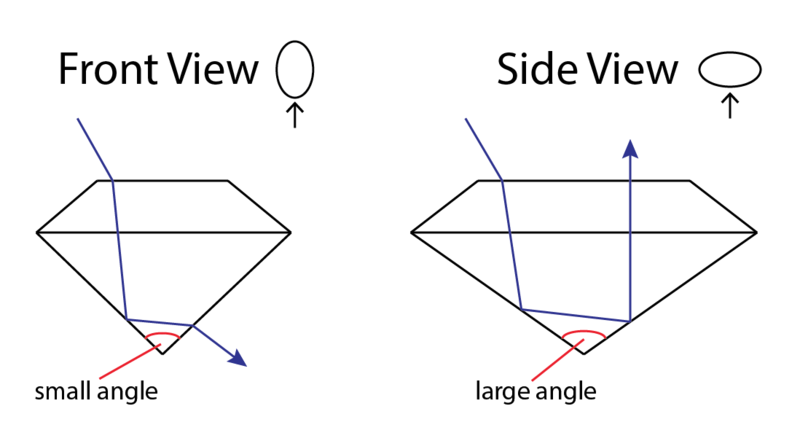 Although the angles of the incoming light hitting both stones are the same, the stone with the higher refractive index bends the light slightly more as indicated by the large angle of refraction. That small difference in angle can determine whether the light bounces back to the viewer or through the bottom of the stone to oblivion. Both brilliant and crushed ice moissanite are beautiful cuts. Subjectively, the brilliant does everything better: fire, brilliance, clarity, and even color (the better light return makes the stone appear whiter). So when it comes to pure gemstone performance, the brilliant gets the nod. However, moissanite is inevitably compared to diamonds, even though it really shouldn’t be. Moissanite is its own unique gemstone with it’s own unique properties. But more often than not, I get asked the question, “which cut looks more like a diamond?” And I must admit this is one of the toughest questions to answer. In all honesty, an ideally cut oval diamond will outshine a crushed ice moissanite any day, but a mediocre diamond probably won’t. However, a brilliant cut oval moissanite can exceed the light performance of that same ideally cut oval diamond. I guess the real question is, do you love moissanite for how beautiful it looks or for how much it looks like diamond?